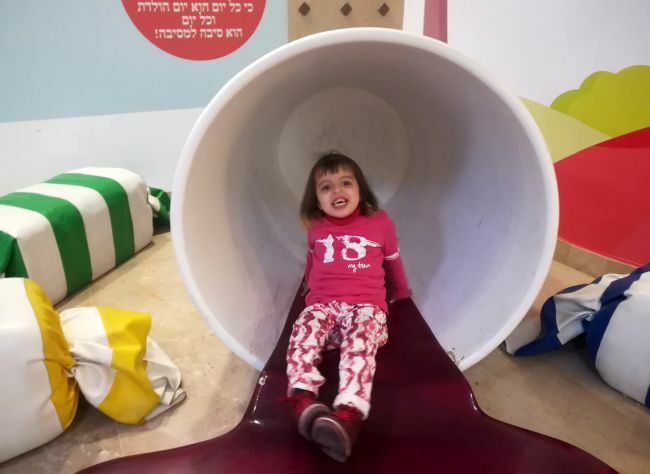 It was good news today for Noora and her family, as they received the news that Noora can have surgery on her hip whilst she is in Israel. The doctor explained today that although the hip will be painless for her at the moment, if it is not operated on and put into the socket, by the time Noora is in her 20s, then she would be in a lot of pain and most probably unable to walk. So of course we really share the joy that this will be a helpful surgery for Noora, and improve her quality of life in the long term. The doctor showed us some photos of the sort of cast which Noora will have to wear for 6 weeks. It will cover all of one leg, down to the knee of the other, and come fairly high up her torso! This didn’t dampen the spirits of her grandma at all, who warmly thanked the doctor for his assessment. When there is a surgery slot available, we will hear from the department, so hopefully there won’t be too long of a wait for them. Of course the news was shared with Noora’s dad, and some other family members on video chat. I write this every time about Noora, but her family are just so joyful and seem to have such a love for each other.